If you wander through the pleasant streets of Schwerin’s center you will find behind old half-timbered gables and modern facades a plethora of all things extraordinary, artful and pretty. Here, where it is often still the owners themselves who are to be found behind the counters of their lovingly managed shops, you don’t just get professional advice; there’s always time for a pleasant conversation and a warm smile to see you on your way. 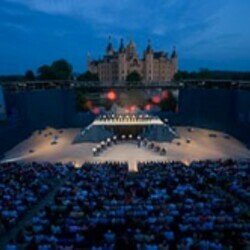 Opera beneath the stars against a romantic backdrop of fairytale turrets and spires: the soul-soaring experience that is the Schwerin Castle Festival. Every summer, a well-known opera is staged here for several weeks, forming the centrepiece of a festival that draws up to 70,000 visitors. Launched in 1993 as a niche event for opera enthusiasts, Schwerin Castle Festival has since become an internationally renowned fixture in the cultural calendar. 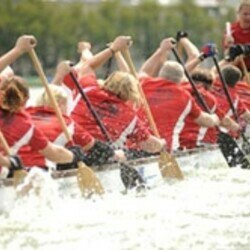 Exotic dragon boats first made an appearance on Pfaffenteich Lake in Schwerin in 1992. They were a real hit with spectators and the team from Schwerin's Canoe Racing Association soon became German vice champions. A year later Schwerin hosted the European Championships. Today the festival is one of the biggest in Europe with up to 200 teams from all over the world taking part in the event. The accompanying entertainment includes live bands, fun regattas and firework displays.